Merry Christmas and Happy New Year! As usual, books were a popular gift with my family this year. There were a few particularly interesting ones among the haul, so I thought I’d share them. 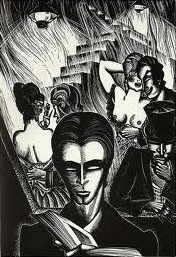 The first is Lynd Ward’s Woodcut Novels, a collection of short stories told entirely in pictures, specifically woodcut prints. These are unlike anything I’ve ever read. They’re subtle, hauntingly beautiful, and not at all acccessible. They stretch my brain in directions it doesn’t stretch often. It’s an odd feeling, uncomfortable and invigorating at the same time. Scott McCloud‘s masterpiece Understanding Comics originally turned me onto Lynd Ward. Woodcut novels were an early predecessor to comic books, aka graphic novels, and Ward’s work is considered the pinnacle of the form. It’s no accident that Art Spiegelman, acclaimed comic artist and author of Maus, edited the collection. I discovered the second book, We Feel Fine, when it was still just a web art project from a friend from work. He and his co-creator pulled millions of blog posts into a database, extracted “I feel” and “I am feeling” phrases, and did some basic data mining. They found interesting and unexpected patterns, illustrated them with examples, exhibited on the web and then in museums, and finally published a book. The result is similar to Ward’s woodcut novels – haunting, affecting, often uncomfortable, and entirely irresistible. I’m fascinated by how it marries such different fields: large scale, data driven, hard edged applied computer science and individual, personal, fuzzy human emotion. I’m looking forward to a number of other books too, but these are the most noteworthy. Thanks, family!